IGB Corp Bhd plans to buy up half of the five-star Renaissance Kuala Lumpur from its Hong Kong partner for RM277.5 million. The 15-year old hotel, located at the corner of Jalan Ampang and Jalan Sultan Ismail, is the largest hotel in the capital with a 921-room inventory. It is owned by Great Union Properties Sdn Bhd, which is 50 per cent held by IGB. IGB has offered to buy the remaining 50 per cent stake in Great Union from Stapleton Developments Ltd and Chong Kin Weng. Stapleton is a unit of Hong Kong-listed New World Development Co Ltd, while Chong is a partner in a legal firm in Malaysia. In the year ended December 31 2010, Great Union posted earning before interest, depreciation and tax (ebita) of RM24 million, while its net assets were worth RM116.6 million. In a statement to Bursa Malaysia, IGB said that the price was 8.5 times that of the hotel's 2010 ebita and the valuation of the hotel at RM710 million net of bank borrowings and shareholders loan. Total cost of investment in Great Union post-acquisition will be RM503 million. The development is interesting given that it is no secret that IGB has always been open to the idea of disposing of the hotel. In fact, it is believed that it was seeking some RM850 million for the hotel. Nevertheless, this purchase could be in preparation to sell the entire hotel at a later stage. IGB officials were not immediately available for comment. IGB told the exchange that with the full management control, it will be able to execute its business plans and strategies more effectively. Initially, the hotel was divided into a four-star New World block and the five-star Renaissance block. In 2004, in line with its global strategy to streamline hotel names, the New World name was dropped and the popular Renaissance name was adopted. The Renaissance name became more popular and the company wanted to develop the name. The New World name is used more in China, a senior hotel manager told Business Times in a previous interview. The management contract between the owners and Marriott International, which is operating the hotel as a Renaissance, is expected to expire in four-and-a-half years. IGB operates hotels under the Cititel and St Giles brands. 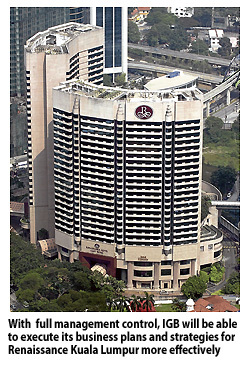 It also owns and operates Micasa All Suites as well as Boulevard Hotel and The Gardens Hotel in Mid Valley. PETALING JAYA: IGB Corp Bhd is acquiring a 50% stake in Great Union Properties Sdn Bhd (GUP) for RM277.5mil cash. The sum comprises the proposed acquisition of 50 million RM1 shares from Stapleton Developments Ltd and Chong Kim Weng, representing a 50% equity interest in GUP for RM101.35mil and settlement of shareholder's advance of RM176.15 mil in GUP, said IGB. GUP is the owner of the Renaissance Kuala Lumpur Hotel, which is located in the heart of Kuala Lumpur. Upon completion of the proposed acquisition, IGB said GUP would become a wholly-owned subsidiary of IGB, adding that it was expected to contribute positively to the future financial performance of the group. “As the controlling shareholder of GUP, IGB will have full management control and hence will be able to execute its business plans and strategies more effectively,” adding that it expected the acquisition to be completed by the first quarter of 2012. Based on GUP's audited financial statements for the financial year ended Dec 31, 2010, IGB said GUP recorded earnings before interest, depreciation and tax of RM24mil while its net assets were RM116.6mil. IGB said it did not foresee any new material risk factors arising from the proposed acquisition apart from various risk factors in the group's current operations. Sunway says the 276.4ha, with an estimated gross development value of RM12 billion, were acquired for RM745.3 million. SUNWAY Bhd has teamed up with Khazanah Nasional Bhd to buy two plots of land in Medini Iskandar, Johor, for almost RM750 million. Sunway said the 276.4ha, with an estimated gross development value (GDV) of RM12 billion, were acquired for RM745.3 million. "The company will be principally involved in conceptualising, managing, implementing and developing the said land," Sunway said in a statement yesterday. Sunway currently holds 38 per cent in the joint venture but will increase it to 60 per cent within 54 months from the date of the lease purchase agreement. It said with the acquisition, the company would have 302ha of development land in Johor, in addition to the existing land in Bukit Lenang, with estimated total GDV of RM13 billion. 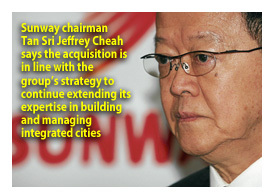 Sunway chairman Tan Sri Jeffrey Cheah Fook Ling said the acquisition was in line with its strategy to continue extending its expertise in building and managing integrated cities. Cheah said the project was expected to contribute positively to Sunway's future earnings and cash flow by 2013. Khazanah managing director Tan Sri Azman Mokhtar said Sunway has a proven track record as a successful master developer in Malaysia and this joint venture is an indication of the company's deepening collaborative partnerships with the private sector. "We are confident this joint venture will further boost Medini Iskandar's progress as a catalyst development for Iskandar Malaysia," he said in the statement. KUALA LUMPUR: Sunway Bhd has expanded its landbank in Johor with the acquisition of two parcels of leased land worth RM745.3mil in Medini Iskandar via a joint venture vehicle with Khazanah Nasional Bhd. The two parcels, which are adjacent to each other, total about 691 acres and has an estimated gross development value (GDV) of RM12bil. 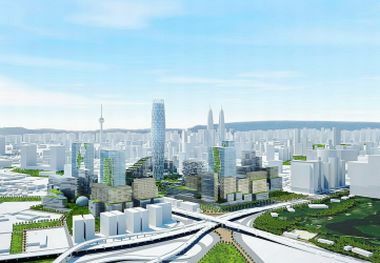 The newly acquired land known as Zone F Medini will boost Sunway's landbank by 30% from the previous 2,145 acres, while the proposed development will boost the company's current GDV to RM32bil,” Sunway said in a statement yesterday. Zone F Medini is strategically located in the heart of Iskandar Malaysia. It is about 10 minutes from Singapore via the Second Link Expressway and 25 minutes from the Senai International Airport. Also in the vicinity are Legoland Malaysia and Pinewood Iskandar Malaysia Studios, which are expected to be completed by 2012 and 2013 respectively, Edu City, Kota Iskandar and the International Financial District, the company said. Sunway also announced a joint venture (JV) with Dayang Bunting Ventures Sdn Bhd, a wholly-owned subsidiary of Khazanah, to form Semerah Cahaya Sdn Bhd. which will principally be involved in conceptualising, managing, implementing and developing the said land. Sunway currently holds 38% in the JV but will increase its holdings to 60% within 54 months from the date of the lease purchase agreement. Commenting on the successful acquisition, Sunway founder and chairman Tan Sri Dr Jeffrey Cheah said the acquisition was in line with the company's strategy to continue extending its expertise in building and managing integrated cities, as exemplified in its integrated developments in Bandar Sunway, Sunway City Ipoh, Sunway Velocity and Sunway Damansara. “We want to replicate this expertise in Johor and develop an iconic development which will capture the local, regional and international market segments as we have done with our integrated developments. “Together with Khazanah, we are confident that we will be able to successfully establish a strong foothold in the state in the near future,” said Cheah, adding that the project was expected to contribute positively to Sunway's future earnings and cash flow by 2013. Khazanah managing director Tan Sri Azman Mokhtar said he welcomed Sunway as the latest major Malaysian developer to participate in Iskandar Malaysia. Sunway has established its presence in Iskandar Malaysia through its construction division which is undertaking three major construction jobs in Iskandar Malaysia, including Legoland, Pinewood Iskandar Malaysia Studios and the Central Utilities Facility at the Bio-XCell biotechnology park. Sunway Bhd's entry into Iskandar Malaysia is a positive move given the cheap price of land acquisition, prime location and existing infrastructure in place. HwangDBS Vickers Research, in a research note today, said the land acquisition of RM25 per square foot was cheap compared with recent land sale at RM38 per square foot. It said with an implied pricing for residential portion at RM400 per square foot and commercial land 15 to 20 per cent higher, completion of other major projects there next year would enhance Sunway's pricing power. "Other benefits include favourable tax incentives, no Bumiputera and low-cost housing content," it said. Meanwhile, OSK Research said Sunway's entry into Iskandar Malaysia would enable the company to build its presence in the region and tap into the abundant growth opportunities offered by the property market there. Both research houses maintained a "buy" call on Sunway with HwangDBS Vickers maintaining its target price at RM3.30 per share while OSK Research's fair value was unchanged at RM3.31 per share. KUALA LUMPUR: 1Malaysia Development Bhd (1MDB) is developing a digital masterplan for a digitally smart Kuala Lumpur International Financial District (KLIFD). 1MDB, which is developing US$8 billion (RM25 billion) KLIFD with its Abu Dhabi joint-venture partner Mubadala Development Corp, has gathered a global team of IT experts and digital planners led by Accenture Solutions Sdn Bhd to draw up the masterplan. "We aim for KLIFD to be a leading financial district with state-of-the-art connectivity," Datuk Azmar Talib, deputy chief executive officer of 1MDB Real Estate Sdn Bhd, a subsidiary of 1MDB, said in a statement. The KLIFD is currently at the master-planning phase and is on track to start construction beginning of next year. 1MDB had appointed Akitek Jururancang (Malaysia) Sdn Bhd and its international partner Machado Silvetti and Associates to help work on the KLFID masterplan.